Experiences of using spaces such as Think.com, have lead me to appreciate the dialogue that can emerge through working with students in online spaces. 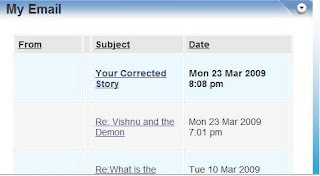 We are currently using the Netmedia Primary VLE in school, as part of an LA Pilot, and a couple of my students, building on their class blogging experiences, have begun maintaning their own blogs, using the space to write about things that interest them and building on the experiences from school away from class in the form of simple learning logs. Visiting the spaces is a treat, listening to the student voice, and gaining insight to how they interpreted things, or how they choose to develop and extend things for themselves. Last week we began phase two of our unit on stories from different cultures, and I noticed that one of the students had begun to write his own version of one of the stories we had previously engaged with. Added to this was a comment, asking what the text was about? Reading the text which began so well, I could see where the commentor was coming from, as the plot began to slip towards the end. Commenting on a blog is a really challenging thing even for adults, so I decided to leave both a comment. First of all asking the commentor a year 6 if he could explain more clearly what he meant, and what the year 4 author might do to make his meaning clearer. To remind the author of the plot of the story I wrote a quick draft of my own, publishing it to my VLE Blog Space, and inviting both students to see what they thought of it by email. How could I improve the text? Would they like to have a go at developing the story for themselves, or perhaps use some of the ideas to clarify the plot. On Monday morning I arrived in school not so much to a greeting, as a discussion around the typos I had made. I wasn't aware of these in my haste to get together the story frame, though no doubt my readers are. It was interesting though to see just how much detail my story had been engaged with as a starting point. I have been aware for some time that my students also visit my blog here occasionally, to share the things they have been doing in school, the potential power of these spaces as "models" for writing seem too good to miss, the sense of audience, purpose and need to be clear if our meaning is to be made. This is certainly something I hope to exploit more widely having recieved this today. I have been out today on a Primary Strategy day, I thought that Monday's dialogue was over but checking my email and the VLE inbox this evening I came across this "Your Corrected Story." Not only has all of my spelling and grammar been checked - thanks J!- but we also now have another starting point for discussion in part of our Literacy session tomorrow. Our plan was to review and evaluate the work the students have been doing today, building on this to edit and improve, but since J has spent so much time reviewing mine already, I am wondering about having him share his process as a starting point before sending the children off to engage with their own stories in pairs. Building on this to help students think about their texts framed by our marking ladders and agreed success criteria, seems quite a powerful in. A lesson or idea I would like to share or take away from this is how a VLE even for the youngest of students need not be a web based flash drive or delivery platform. A way of transferring, accessing, storing or sharing work that teachers make for children and colleagues to use at school. If I am honest this is one of my biggest fears and concerns about how these spaces are often portrayed within the literature we recieve or in the conversations we have with colleagues. There is a danger also of seeing these environments as places where traditional homework types and tasks can be uploaded in a digital format in the assumption that this somehow makes them more appealing. I would like to see our space increasingly seen as a shared space where we all have ownership, and a sense of belonging. VLEs like classrooms and schools need to be considered social learning spaces extensions and mediators for informal as well as formal learning experiences. Our Asus web books are just about set up, and ready to be used. What further opportunities will wireless access on a one to one and paired access have on their development and use of this space? Wonderful to read about your children blogging and collaborating on writing. Instant feedback for a writer in the form of a comment is so powerful. It is what I call an authentic blogging experience for children rather than blogs that share best work. There is a place for these but it is not what bloggers do when they write. The NCSL found that for online communities, which is what a school VLE can be, to be effective they must be as simple as possible in order to encourage users to participate and engage. We want school learning and home learning to blur and become one with them so that there is just learning. An interesting piece, Simon, and an interesting response from Joy. The NCSL seems to understand the need for simplicity in these tools, and this is where so many of them fall down as they get ever more and more complex in a bid to "out feature" each other. Had your writing been on your own blog, everyone would be able to see it and criticise the writing, not just members of your VLE community. While I appreciate that you don't want to share everything with a wider audience, but opening up your efforts to a global community can bring all kinds of interesting perspectives to bear. This is why my own preference is for a simple blog platform - too many teachers are led down the road of content delivery through VLE training sessions, whereas the real transformational poer of such technology is in authentic collaboration.